Just wanted to say it looks good. Thanks Ashitaka! Glad you like the experimental style! I like the photo-like effect, it produces. I used it before for the Genius bar, where they have photos of exceptional people. I thought my usual outlined style wouldn't be good for that nice, glowy light of candles. Dragonman, sorry for the offensiveness, I double-checked the image, and I think it's a stock image, the image is used for 911 and for a gay marriage rights protest. Candle light vigils are usually held for memorials, especially massacres. I purposely chose this one because they are almost all university/college age people, which I would think would reflect the age of people who are passionate about their iphones and ipods. I didn't mean to be disrespectful. I really like how it turned out, tho. FWIW, I really like it too. There's beauty in the bleakness of the style. I'm not sure it's always going to be appropriate for JoT, but for this comic it works very nicely. As comedy should, it touches on some of the absurdities of fandom. 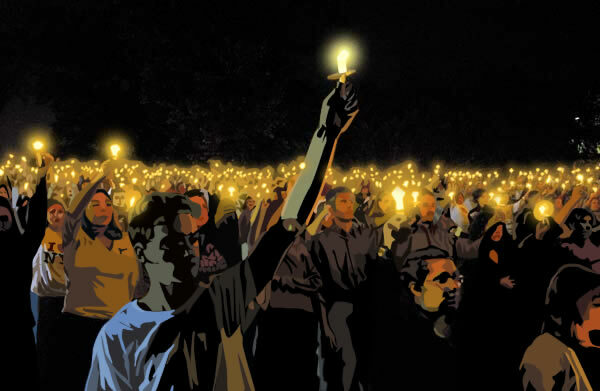 A poignantly rendered candlelight vigil over an Apple product? Come on. That's just funny. The 9/11 bit is kind of a sore spot with me, as I'm tired of over-exposure to that stuff. 9/11 happened, and was a tragic thing, but news media and GWB+Rudy have just done it to death, so I'm pretty much sick of such imagery. If there are any linguistical bugs... Please show them to me!